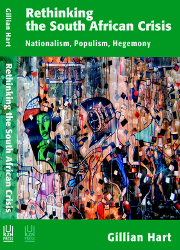 WISER and CISA are very pleased to host the launch of Gill Hart's new book, Rethinking the South African Crisis: Nationalism, Populism, Hegemony, published by UKZN Press. Since the end of apartheid, South Africa has become an extreme but not exceptional embodiment of forces at play in many other regions of the world: intensifying inequality alongside ‘wageless life’; proliferating forms of protest and populist politics that move in different directions; and official efforts at containment ranging from liberal interventions targeting specific populations to increasingly common police brutality. Rethinking the South African Crisis revisits longstanding debates to shed new light on the transition from apartheid. Drawing on nearly twenty years of ethnographic research, Hart argues that local government has become the key site of contradictions. Local practices, conflicts and struggles in the arenas of everyday life feed into and are shaped by simultaneous processes of de-nationalisation and re-nationalisation. Together they are central to understanding the erosion of ANC hegemony, and the proliferation of populist politics. This book provides an innovative dialectical analysis of the ongoing, unstable and unresolved crisis in South Africa today. It also suggests how Gramsci’s concept of passive revolution, adapted and translated for present circumstances with the help of Fanon, can do useful analytical and political work in South Africa and beyond. Gillian Hart is Professor of Geography and Co-Chair of Development Studies, University of California, Berkeley, and Honorary Professor, University of KwaZulu-Natal, South Africa. She is the author of Disabling Globalization: Places of Power in Post-apartheid South Africa (2002) and co-editor of Gramsci: Space, Nature, Politics (2013).